Forecasting the sales of “short life cycle” items (seasonal, event-driven, one-time, treasure hunt, clearance, etc.) presents different forecasting challenges than occur with basic, replenishment or staple items. It is common for this year’s short life cycle merchandise to be a ”new” or “different” version of the SLC item or class that was sold during previous years. Complicating things further, the events or holidays vary by calendar day and even week each year, while other variable factors may be based on weather or fashion trends. The challenge of managing short life cycle items is the need to buy, assort, allocate, price, promote and markdown in an profitable manner. Churchill’s Short Life Cycle Demand Forecaster™ (SLC) software provides a demand-based foundation for the SLC challenge. In an automated manner, SLC sets up and creates pre-season forecasts based on (1) “similar-to” profiles for preseason planning and initial forecasting; (2) demand (not sales) based allocation for store/item planning and forecasting; and, (3) any-level “statistical curve-fitting” for in-season plan and forecast updating. 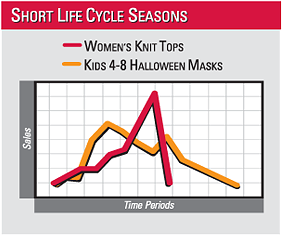 Short Life Cycle Demand Forecaster is high volume, seasonal product forecasting software that provides the answers—when they are needed. With the SLC’s early season reporting, retailers can predict and manage expected “full-season” sell-through positions with time to take inventory, pricing and other corrective actions during the selling season. If necessary SLC (when combined with PDF) can support optimized clearance markdowns.